Well, I've survived the conference! More than that, I have learned a great deal about medieval Scandinavia. Rather to my own astonishment, I think I might have successfully "networked." And as a bonus, I learned about a new opera! Julian Philips' "Knight Crew" had its premiere this past month, is described as a "new youth opera for 14-19 year olds," and is available for download through Glyndebourne. It's a retelling of Arthurian myths in two acts, with the theme of--wait for it--gang violence at its center. King Arthur meets West Side Story? The "Knight Crew" are deadly enemies of the Saxons, and Art kills a Saxon in the battle which functions as his initiation (after which he is haunted, like Richard III, by a chorus accusing him of his bloody deed.) To be honest, I was more intrigued than enthused by the premise. Putting my defensiveness of my beloved King Arthur legends aside, though, I have to admit that a gritty, urban adaptation of the basic outlines of Arthur's political rise and fall (mostly taken, it would seem, from Malory and the Matter of Britain) makes for a story that--like the originals--raises challenging questions about the nature of loyalty, cultures of violence, and the foundations of legitimate authority. Photos of production rehearsals may be found here. (The recording from which that is taken is available for purchase here . My mouth is watering.) 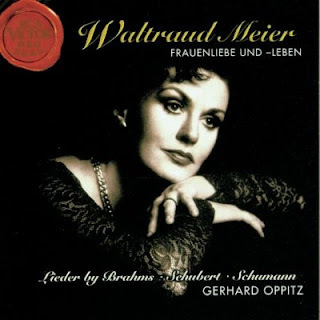 Another joyous discovery this week was a new addition to the local library holdings: Lieder from Kasarova ; my favorite of the lot was probably Schumann's "Widmung," of which I never tire. Another activity: listening to my cherished Fritz Wunderlich CDs a lot. Wunderlich is one of my love-at-first-note singers. I fall into adjectival clichés when trying to describe his voice: golden, honeyed, creamy. Maybe it's partially memories of Sunday afternoons with my father and his phonographs, but the beauty of Wunderlich's voice soothes me like few other sounds. Hearing him sing "Viens, gentille dame," or "Dies Bildnis," or "Dalla sua Pace," (all in German, creating a slew of exceptions to my sing-it-in-the-original-language-dang-it purism) is like receiving reassurance that everything, really, will be okay. There are times I want opera to set my pulse racing, and other times I need it to help me take deep, slow breaths. This week was one of the latter. What do graduate students do with spring break? Why, take advantage of the quiet library during the day, and take advantage of its early closure to go see opera in the evening! 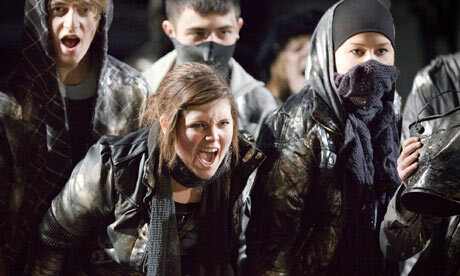 There were three of us who planned ahead and bought tickets to make sure we didn't miss Verdi's Attila. As the Met tirelessly reminded us, this was to be an Event: the first time the opera was performed at the Met, Riccardo Muti's Met debut, etc. Being medievalists, we were especially excited at the prospect of tumultuous fifth-century history (plus myth, of course!) on the opera stage. On Saturday afternoon, I braved the weather to stand at the top of a packed house for the much-anticipated production of "The Nose." Between the sinister absurdity of Gogol's plot, the torrential sound of Shostakovich's music, and the provocative commentary of Kentridge's direction and set design, I found it to be a demanding experience. This is anything but a complaint: thanks to the orchestra under Gergiev and the fine singers, I never felt lost. And I was excited to find Kentridge's much-hyped production stirringly bold without heavy-handedness. (If I divide less-than-literalistic production designs into those which make me think, "What are they doing?!? WHY?!?" and those which make me think, "Hm, how interesting, I wonder if..." this would fall into the latter category.) 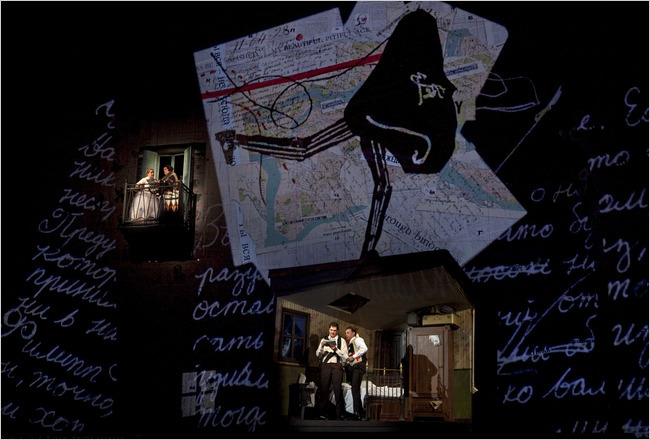 As the above picture from the New York Times (showing the letter scene between Kovalyov and Mme. Grigorievna, with fugitive nose above) illustrates, it was frequently dominated by text, and individuals were dwarfed by their surroundings, their own actions in sharp relief against context which threatened to confine and crush them. An art critic's review of a Kentridge exhibit including his Nose-related work may be found here; a forthcoming book of prints here. Gergiev made precise, ironic-humorist sense out of a score which (according to the program note) is over 500 pages long. I wish I could more effectively analyze the strident or ethereal solos, the furious, frustrated attempts of individuals and groups to make themselves not only heard but understood (the scene where Kovalyov attempts to place a newspaper advertisement was especially striking.) The orchestra made the absurdity of the unfolding events seem fateful. I was surprised by the amount of laughter I heard in the audience; I don't deny Gogol's (and Shostakovich's) humor, but it was dark enough that I didn't feel one could laugh except uneasily. Perhaps the greatest compliment the audience paid the work was the buzz of talk that started even during the curtain calls and continued past the doors onto a rain-lashed Lincoln Center. Egli muore! o, ciel, ei muore! Last Sunday, as posters around the city and banners on websites insistently reminded me, the Oscars were awarded. In theory (leaving aside the probably disheartening answer of how the system of nomination actually works) this celebrates Excellence in Film Generally. And I have a confession: besides Cinematography, the acting categories are usually the only ones--if any--that really arouse my partisanship. (Related confession: I don't see many films, because if I have a choice between spending $12 on a film and $20 on an opera...!) And all this is leading up to something: what about acting in opera? I can't imagine what Maestro Gergiev would do on a podium; here he stood in the midst of his orchestra (in a space curved forward like a proscenium in reverse) behind a music stand. And "stood" is a misleading verb. On the second night, his movements were usually limited to an encouraging sashay to one side or the other, or a few steps back to give scope to his cues for the chorus. In directing the frenetic fall of Troy, however, he fairly danced, darting and swooping with the movements of the music itself. There were moments when, directing the chorus, he actually left the ground with both feet. Nor did this come across as histrionic distraction; the orchestra and the chorus reflected his energy. Alas, I will never be that fabulous. But revenons à nos moutons: the Brahms Ziegeunerlieder are fiery and seductive. "Frauenliebe und -leben" is deliciously expressive, full of personality which I often struggle to find there. And with the Schubert, transcendence is reached. Maybe it's partially my own temperament which predisposes me to find resonance here; but I have listened to these untiringly. And I learn, in the bland language of Amazon, that the item has been discontinued by the manufacturer! Mein Herz ist schwer. Ah well... for this, as for so much else, I will rely on the NYPL... and trust that "Gretchen am Spinnrad"--and "Die Junge Nonne," and "Der Tod und das Mädchen"!--are not actually essential to the process of research... even if it feels like it. The title of this post is intended to be read in German, as a confession of shame [Schmach] rather than a dismissive splutter of indifference. Yes, among the Really Shameful Confessions which seem to be piling up is that the concept and limits of fach have been a source of confusion to me. Of course, I've done enough opera listening to understand that a tenore di grazia and a Heldentenor are on opposite ends of a spectrum where lirico and spinto come somewhere in between. But what about a lirico spinto? What about singers who transition into (predominantly) one type of repertoire from another? What about Placido Domingo? When more experienced devotees (usually in the line for Rush Tickets at the Met) started talking about a singer's fach, I remained shyly silent, trying to understand what was going on and what the disagreements were about. Like the protagonist of Daddy-Long-Legs , however, I usually cope with not understanding things by quietly going and reading up on them. The faithful branch libraries of the NYPL provided me with Fred Plotkin's Opera 101 (clearly mendacious subtitle: "a complete guide to learning and loving opera.") I found it less patronizing than I had feared (hooray), frequently entertaining, and on pages 125-43 (sneakily viewable through Amazon), informative about fach. What about Placido Domingo? may be a question for the ages, but I feel better informed now. Whew!